Evening sky on Saturday November 1 looking south as seen from Adelaide at 22:00 (10:00 pm) ACDST in South Australia. 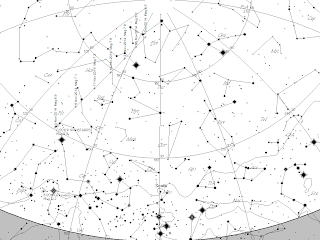 Comet C/2012 K1 PanSTARRS is just above Canopus. Similar views will be seen elsewhere at the equivalent local time (click to embiggen). 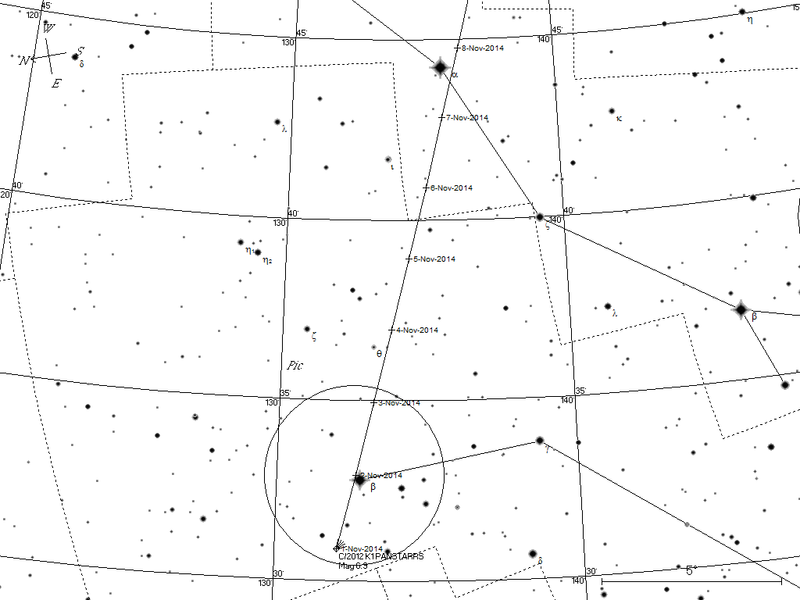 Animation of the path og comet C/2012 K1 PanSTARRS from 1 November to 30 November. 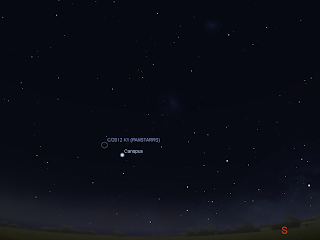 The point of view changes mid animation as the comet rises towards the zenith. Click to embiggen. 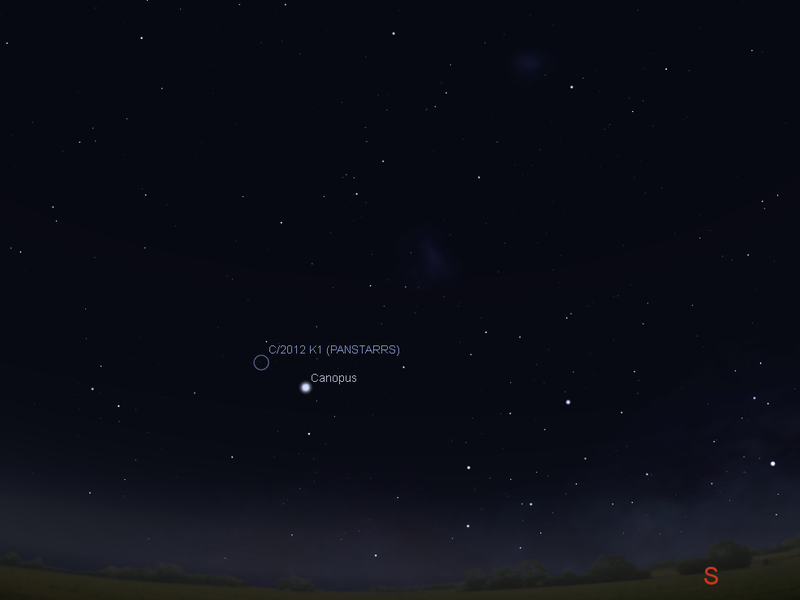 Comet C/2012 K1 Panstarrs is now visible in the evening sky. From the begining of November it should be high enough above the horizon at 10 pm to pick up. It should be easily visible in 10x50 binoculars as a fuzzy dot. At magnitude 7 you will need to let your eyes adapt to darkness to see the comet clearly. You may need to check from night to night to see it move to be certain of your identification. In a small telescope it looks like a ball of fluffy cotton wool. You will need a decent CCD camera and a larger scope to see the dust tail. The comet doesn't have any spectacular encounters, but will look nice amongst the stars. 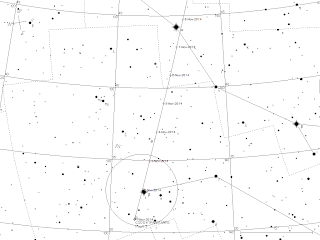 On the 2nd it is very close to the star beta Pictoris. The comet is closest to Earth on the 6th, but the almost full Moon will make it difficult to see. When the Moon leaves the evening sky the comet should be readily visible in binoculars. It may even reach the threshold of visual observation magnitude 6 (although you will need a dark sky site to see it), but this is unlikely.